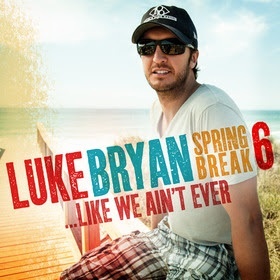 ACM Awards Show co-host and reigning Entertainer of the Year Luke Bryan will release his next Spring Break-themed digital EP on Tuesday, March 11, 2014, Spring Break 6…Like We Ain’t Ever. The album contains six original songs, all co-written by Bryan. Bryan will play two free concerts at Spinnaker’s Beach Club in Panama City, Fla. on March 11 and 12 for the sixth consecutive year. Last year’s shows saw a two-day crowd total of 120,000 fans. Bryan’s previous five Spring Break releases have sold over 750k copies. Last year’s album debuted at No. 1 on the Billboard Country sales chart and earned him his first No. 1 album on Billboard’s Top 200 chart, selling 149,515 units its first week.